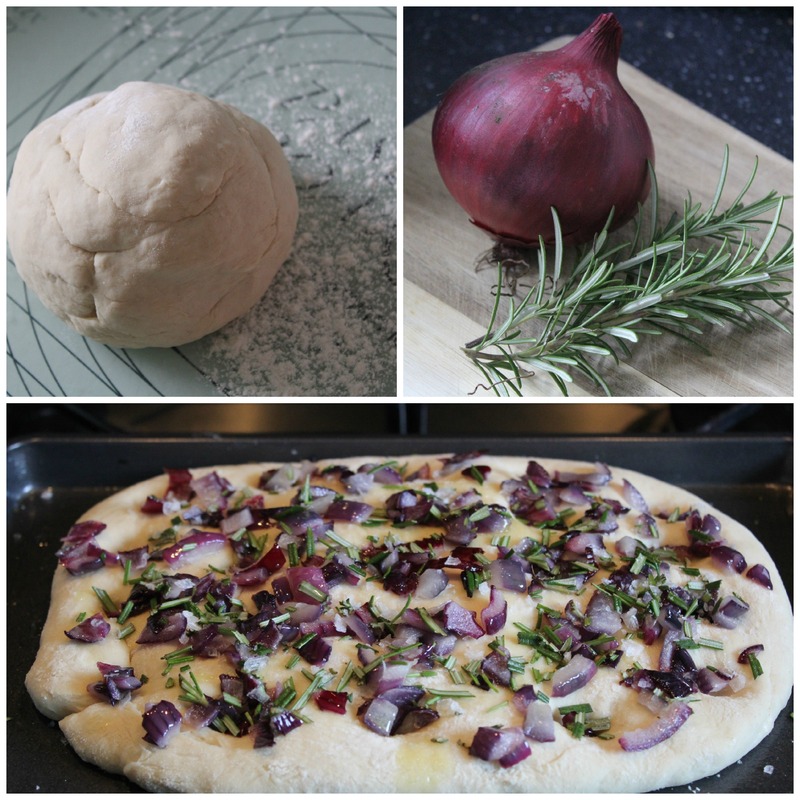 We had a fantastic harvest of red onions from the allotment last year, and with only two of the beauties left, I thought I’d pair one with the rosemary we have growing in our back garden to make a delicious focaccia. Sift the flour into a large bowl before stirring in the yeast and fine salt. Make a well in the centre and pour in 150 ml of warm water with 1 tbsp. of the oil. Mix together with your fingers. Turn onto a lightly floured surface and knead for approx. 5 minutes. Meanwhile, gently fry the onion in the oil over a low heat for approx. 10 minutes and allow to cool. Punch the dough to knock it back before rolling it into a rectangle about 2.5 cm thick and place it in a shallow, oiled baking tin. Cover and leave to rise for a further 30 mins. Preheat the oven to 190C (170C fan oven). Dimple the surface of the bread by gently pressing a finger into the dough at regular intervals. 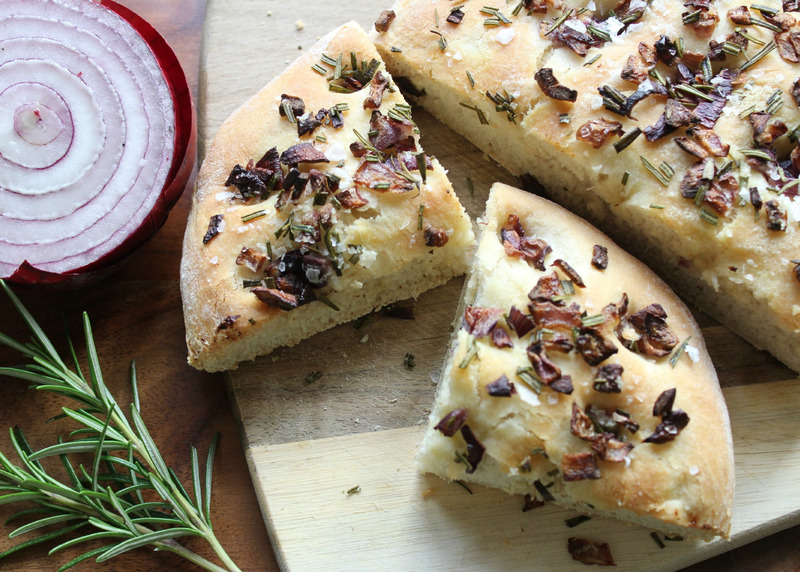 Scatter the cooled red onion, chopped rosemary and coarse sea salt over the bread before drizzling with the remaining olive oil. Bake for 30 minutes until the bread is well risen and golden brown (but keep an eye on the bread from about 20 minutes to make sure the onion doesn’t burn). Allow to cool for 5 minutes or so before cutting in wedges and serving. This really is divine and best eaten fresh from the oven but it keeps quite well for a day or two if kept sealed in a bag inside a cake tin. Just give it a few seconds in the microwave to warm up and re-soften when serving the next day. Gosh mouthwatering and you’ve prompted me to have a go later this week. It will have to be supermarket red onions though but lots looking good and growing well on the allotment. Thanks Sue, hope you get a good crop! Thanks Benjamin, have fun baking! This sounds really yummy and something new to try. thanks for posting this up.